San Antonio isn’t doing itself any favors in what is the toughest stretch of its season. When we looked at the 2018-19 Spurs schedule a few months back, a particular 10-game stretch in November immediately stood out. It wasn’t necessarily the competition, although it did include tilts against the Warriors, Pelicans, Pacers and Bucks, but more the extensive travel packed into a short span of time, and how the Spurs might balance the long view with the ever-present urgency to win now. To recap: beginning with Monday’s game in Sacramento, the Spurs are playing 10 games over 17 days. Two of those are at home, but they basically serve as cursory layovers before hitting the road again. There are three SEGABABAs and one FIGASENI, and over 4,300 miles of air travel when it’s all said and done — and then they return home to face a Rockets team that’s just beginning to get its groove back. There are major studies that have looked at the impact short-haul travel has on NBA player performance, fatigue and injury — when you add to this the fact that the Spurs are among the league’s older teams, not especially healthy, and play a physically taxing style of offense, it’s clear how important it was for San Antonio to start strong and bank those first three games against the Kings and Suns before fatigue set in. But the Spurs dropped all three games and now sit at 7-7 and will almost certainly finish this slog somewhere below .500 — as bad as things are now, they’re likely to get worse. Multiple factors have contributed to the recent struggles, and the most widely discussed will probably be LaMarcus Aldridge’s Siberian shooting percentages — with good reason. For the season, he’s shooting 59.6% on 6.4 attempts a game from within 5 feet and just 30.7% on 10.1 attempts from beyond 5 feet. Over his last six games, those averages drop to 46.4% and 28%. DeMar DeRozan has been great, but he can’t do it all on his own. The Spurs need to figure out: a) how much of this is a slump, and b) how much is because Aldridge (as much a rhythm player as there is in the NBA) hasn’t yet settled into the circadian patterns of the new offense. The various new roster pieces haven’t helped ease Aldridge in. He was terrific last year when the team lacked high-usage wings to create on the perimeter. Now there’s not only DeRozan, but Derrick White looking to figure out, more or less on the fly, when to be aggressive, when to facilitate, and when to simply put the team’s two best scorers to work. White’s insertion into the starting lineup 5 games ago has thrown off the team’s balance by adding another ball-dominant wing who takes away touches and doesn’t quite move the ball with the kind of zip the system requires. With him in that group, the assists have gone down (1.20 assist ratio), turnovers have gone up (16.4% rate), and the team is putting up a -31.8 net rating over the 60 minutes that quintet has shared the floor. This isn’t a knock on White, who has overall looked like a fine NBA player in year two, but the chemistry and pace are not the same with him, and that lineup could benefit both his development and the team’s ability to win in the short term if he was to either play more off ball or slide into a bench role. A lack of continuity has rendered one of the team’s longstanding pillars — rote execution on both ends of the floor — MIA. This was expected going into this season, but we’re still seeing it in the defensive rotations, lineups, and little things like how everybody instinctively reacts to, say, a predictable double in the post. Continuity once allowed the Spurs, even when shorthanded or on the road, to calmly dispose of middling opponents — now a lack of it is their downfall. The latest spat of injuries to Pau Gasol’s foot and Rudy Gay’s heel hasn’t helped develop new continuity. Gasol’s contract aside, he knows what he’s doing defensively and fulfills a number of roles on the other end. Nobody’s better at finding Aldridge in deep position courtesy of hi-lo sets, and he greases the skids of the motion-heavy second unit by serving as a triple threat from the elbow. Gay has been great this season when healthy, but his nagging heel injury has kept him out of 4 games and appeared to be the reason for him sitting out the end to Thursday’s loss in LA. It’s generally hard for Spurs fans to accept sub-optimal conditions without gravitating towards the green light across the water that is tanking. But that’s where we are 14 games into 2018-19: unsure of what kind of performance we’ll see each night (for the foreseeable future, at least) and mining the defeats for small victories they can build on moving forward. 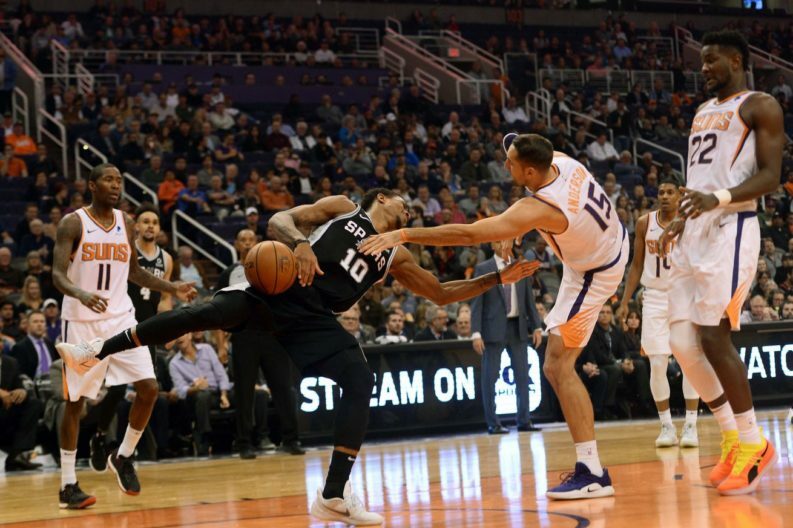 The good news: the final stretch of the 2018-19 schedule still looks soft, and if the Spurs keep themselves in the hunt by surviving bumpy periods like this, continue refining the parts of their game that each loss exposes, and — who knows — get a little luck in the health department, they could find themselves coasting come March.